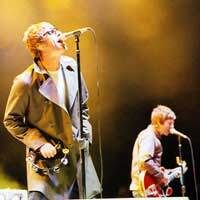 They became the biggest hit of Britpop, arriving in 1993 and still going strong, in spite of some personnel changes and animosity of many kinds between Noel and Liam Gallagher, the Manchester brothers who front the group. Their career has undergone its ups and downs, and a few releases have lacked a little quality, but their ability to come back and create hits has been proved. There’s plenty of Oasis memorabilia out there, although many of the items offered by dealers are promotional pieces sent out to journalists and radio stations to advertise CD releases. These are fine, and wonderful novelties, but the appeal of a Stop the Clocks promotional dartboard (£1,500) or full promotional set (dartboard, Frustration game and more for £2,200) is really with collectors, as is the Oasis Frustration game at £950. Perhaps the best pieces of memorabilia are handwritten lyrics by Noel Gallagher. One dealer has a single sheet for £1,200, which had come from a notebook sold at auction by Christie’s in 1998. Another dealer has the rest of the book, which is basically a plan for the band’s first two albums, being offered at a hair under £6,000 – a price that represents much better value. Tour itinerary books will run around £85, but again, these are more for collectors, as are gig tickets, which can cost from £8 to £20 (for a show in the Philippines). A printed set list (not written) and backstage pass together was being offered for £50. Tour crew items fetch a fairly high price, with £395 for both a bag and jacket, and the same for a pair of Doc Marten boots made for the tour crew and marked “Oasis". An RIAA platinum award will cost you £595, very much in line with award discs for the period. What about autographs? You can find them, but the price is going up. One dealer was hawking a framed, autographed CD for £400. That’s on the high side, but you can definitely anticipate paying in the low hundreds for a full set of band signatures, with a little less for Noel and/or Liam. With very rare exceptions, like that notebook, you’re not going to find Oasis items at the major auctions. They’re still too new, however many records they’ve sold, and the values in general aren’t yet high enough to warrant interest by the auction houses (the big money is still in the classic groups). eBay is fine for the lower-priced items, and you should also find the occasional promotional piece and autographs (although, as always, remember that it’s a case of buyer beware without a certificate of authenticity). In most instances, though, you’re looking to dealers if you want to buy Oasis memorabilia. This means you might end up paying a little more than you might otherwise, since the dealer needs to make a profit, but you’re getting genuine items, and they will be shipped to you. Is Oasis memorabilia a good investment? In a word, yes. Most prices are still quite reasonable, but are rising, and will continue to do so. With their classic rock sound, it’s only a matter of time before Oasis graduate to the top echelon of collectable groups.